We are Over The Moon for this crystal and silver sparkler! 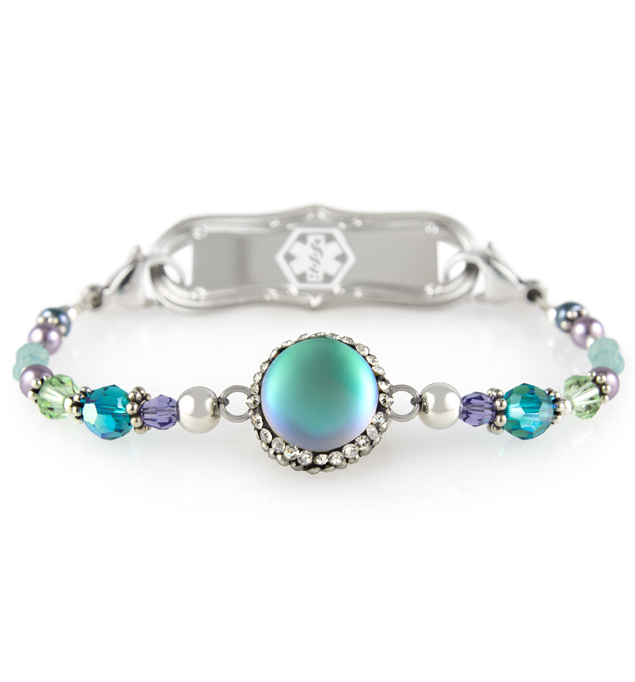 Featuring symmetrical beading on either side of a cubic zirconia-ringed, smooth, blue-green moonstone centerstone, this pretty medical ID bracelet is sure to become one of your favorites. With varying blue and green crystals interspersed with sterling silver balis and spheres, this go-to style is as perfect with jeans as it is with your favorite dress. As with all of our interchangeable designs, your Over The Moon Medical ID Bracelet pairs with any custom-engraved Lauren’s Hope medical ID tag, keeping what’s truly most important to you right at hand. This stylish med ID is a great choice whether you or your loved ones wear medical alert bracelets for a history of Type 1 Diabetes, epilepsy, asthma, food allergies (such as peanut, tree nut, soy, or wheat allergies) or for any other medical condition or treatment consideration. Custom engraving allows you to choose the look you want so you can stay safe in style.